America’s beverage companies are committed to the health and preservation of our environment. 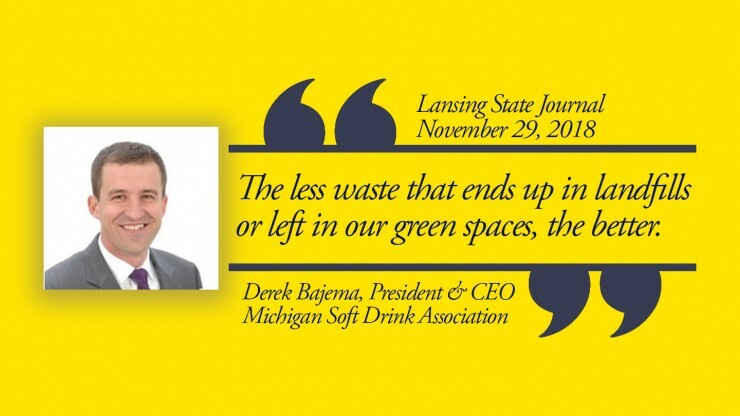 Derek Bajema, President and CEO of the Michigan Soft Drink Association penned an op-ed in the Lansing State Journal discussing the various environmentally friendly initiatives our industry has introduced. “The less waste that ends up in landfills or left in our green spaces, the better. This is especially important in areas near bodies of water like our freshwater Great Lakes. That's why, as part of all their voluntary efforts, beverage companies have focused on promoting recycling in proximity to lakes, rivers, and other bodies of water,” said Bajema. America’s beverage companies produce 100 percent recyclable aluminum, plastic and glass beverage containers; even the plastic caps can be recycled! We’re also working to recycle production waste- 94 percent of waste from our manufacturing plants is being recycled and diverted from landfills. Bajema highlights partnerships between non-profits, business groups and the government as an integral part of the changemaking process. “We believe those solutions are best achieved, and ultimately our planet is better off, when the private sector and the government work together to implement environmental programs that are proven to work,” according to Bajema. Just as Bajema mentions, our industry is leading by example in fostering connections all in the name of environmental stewardship. PepsiCo Foundation linked up with the Recycling Partnership to create, “All In On Recycling,” an effort to make recycling more accessible through grants, programs and other tools. The Coca-Cola Company worked with government officials and world leaders to sign the Ocean Plastics Charter at the 2018 G7 Summit, allowing for a future with more sustainable plastic usage and design. Keurig Dr. Pepper and Keep America Beautiful partnered to fund 34 grants allowing for 936 additional recycling bins in American public parks. Whether it be Michigan’s Great Lakes or California’s national parks, these partnerships are working to keep our country beautiful. Check out Bajema’s full op-ed here and InnovationNaturally.org for more information about the industry’s sustainability goals.